When Arccos Golf launched its first performance tracking system for golfers, it combined the telemetry from sensors and a smartphone app to give players detailed data and feedback about every shot. Knowing how far and how accurately they could hit the ball under different conditions helped players uncover weaknesses and improve their game. But there was so much more that could be done. 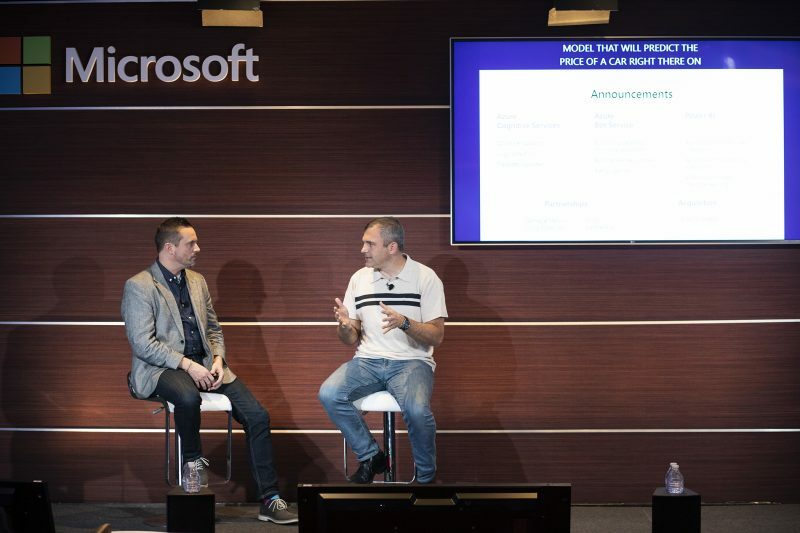 Arccos Golf SVP Jack Brown demonstrates Arccos Caddie at Conversations on AI, a Microsoft event in San Francisco, Calif.
Anhueser-Busch InBev VP Tassilo Festetics tries out HoloLens at Conversations on AI, a Microsoft event in San Francisco, Calif.
Microsoft CVP of Azure Julia White speaks on stage at Conversations on AI, a Microsoft event in San Francisco, Calif.
Microsoft Technical Product Manager Nishant Thacker demos drone experience at Conversations on AI, a Microsoft event in San Francisco, Calif.
Microsoft CVP of Azure Julia White leads panel discussion at Conversations on AI, a Microsoft event in San Francisco, Calif.